Lens Description: Lens-making is an art - Nikon artisans craft Nikkor optics from the finest materials, taking pride in adding their intellect and technique to bring the world\'s finest lenses to life. They push the leading edge of lens-making in their effort to provide the \"glass\" that makes the world\'s greatest pictures.rnAF Nikkor lenses work with Nikon SLRs for optimal performance, even the very latest. 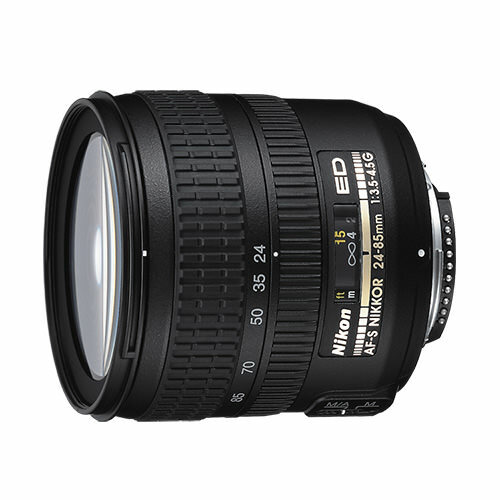 The Nikon 24-85mm f3.5-4.5G ED-IF AutoFocus Zoom Nikkor Lens is a wide to telephoto 3.5x zoom lens ideal for landscape, full length portraits, travel and portrait photographs. The Silent Wave Motor enables ultra-high-speed autofocusing with exceptional accuracy and powerful super-quiet operation. The lens boasts a compact size and high performance realized by new optical system including an aspherical lens and ED glass element.rnrnIt also features rounded diaphragm (7 blades) for natural blur, 14.96-inch closest shooting distance, M/A mode that allows rapid switching between autofocus and manual-focus operation, and Internal Focusing design for smoother focusing and great body balance. A flower-shaped Lens Hood HB-28 is provided. The Nikon D-type design provides precise distance information for flash and ambient light exposure processes, while the new G design enables apertures to be selected from select Nikon AF SLR camera bodies. The high-performance Nikon Super Integrated Coating offers superior color reproduction and minimizes ghost and flare.